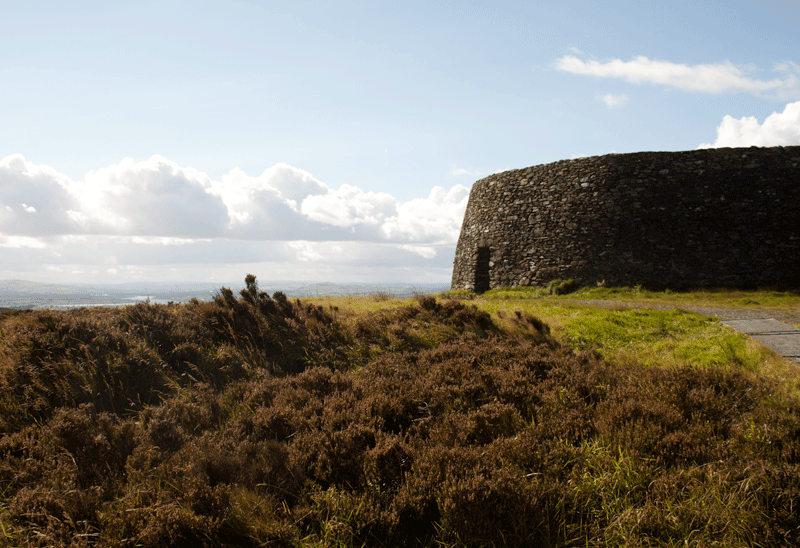 Grianán of Aileach or Grianán Ailligh is a cashel on the Inishowen Peninsula in County Donegal. 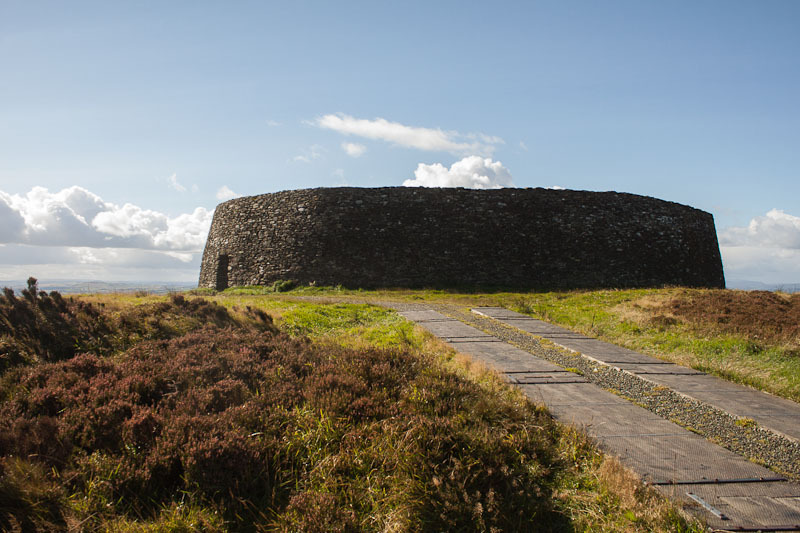 Also known as the “Sun Palace,” it was the royal citadel of the northern Ui Néill (O’Neills) from the 5th to 12th century. The cashel dates to the third century and archaeologists suspect it could have been built on a former Neolithic sacred site or burial mound. 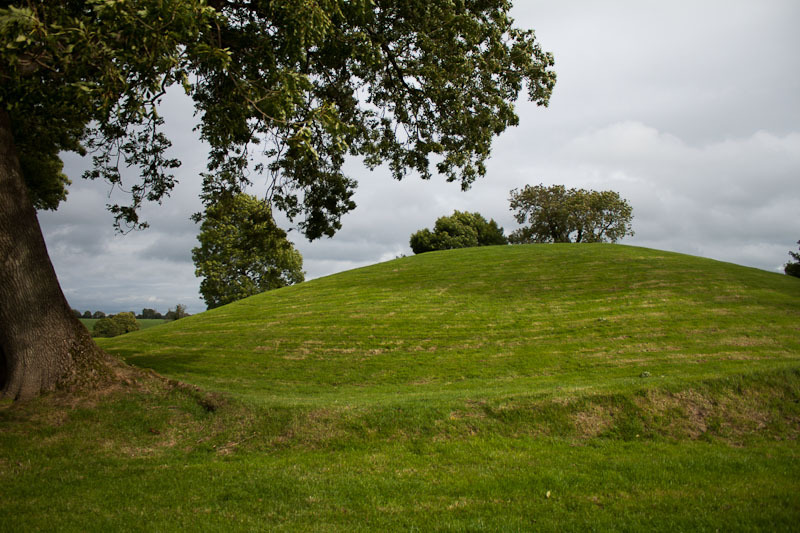 Experts in Irish culture and heritage believe that the mound was used for ritual purposes as far back as 1700 BC and was the center of one of Ulster’s ancient kingdoms – and later the political center of the ruling O’Neill’s and later the O’Donnells. This would have been the royal center, where kings were crowned and rituals carried out as well as a defensive structure. 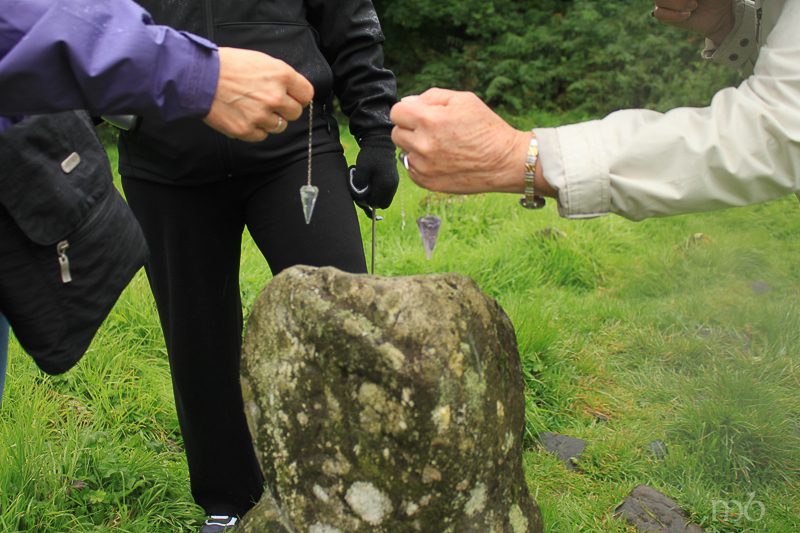 Though the actual ring fort was probably built in early Christian times, the three concentric rings surrounding the cashel as well as artifacts discovered in the surrounding rings suggest this spot was used for ritual much earlier. The cashel itself is 77 feet in diameter and its walls are 13 feet thick with chambers embedded. Inside the circle are stairways built into the inside walls the lead to ringed seating areas – like an amphitheater. This seating gallery would hold hundred of people who could witness inaugurations and other ritual ceremonies. From the top of the ring one can see for miles in every direction. 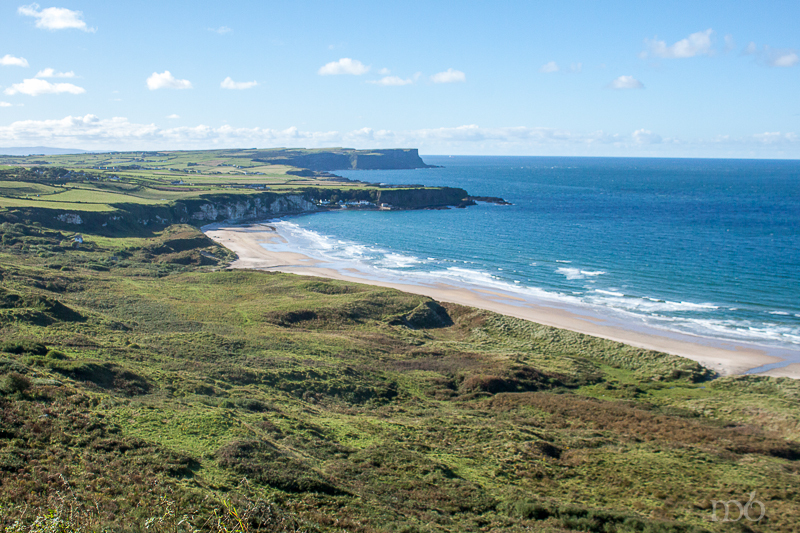 Counties Tyrone, Donegal and Derry are in view with mountains, cliffs, open pastures, villages and beaches. 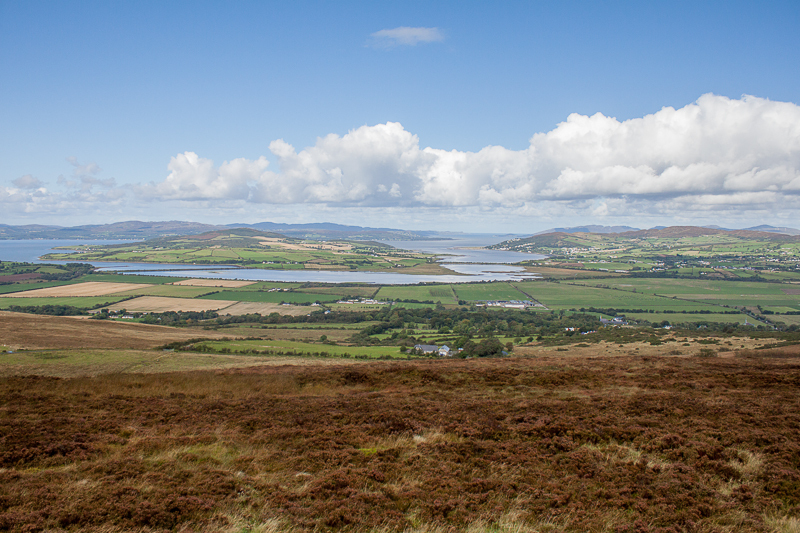 Lough Foyle and Lough Swilly, the two bodies of water that flank the Inishowen Peninsula swirl about in that landscape. The peninsula rolls out like a blanket from this vantage point, eventually vanishing in a misty gray horizon (on a sunny day, that is). It’s easy to understand how the cashel on dominated the region and became as the political center. Its remarkable disk-image capping a hill 800 feet above sea level is visible to so much of the surrounding countryside. 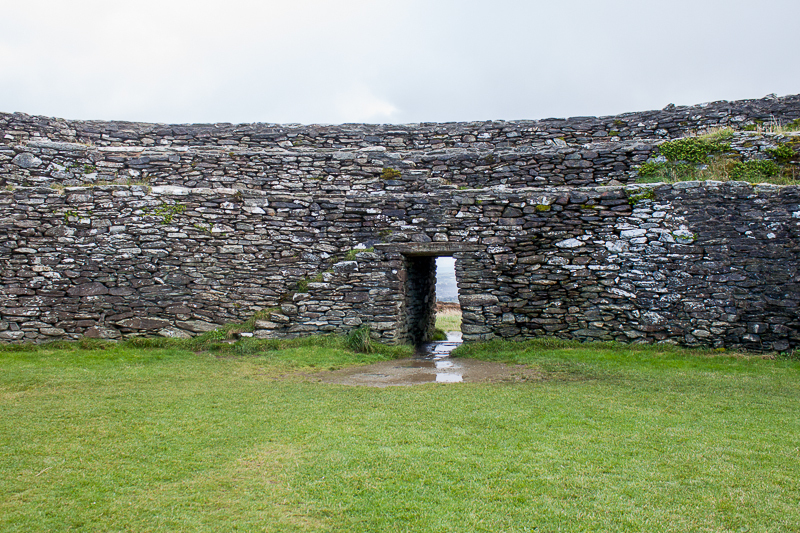 Cashels were built for defensive purposes, but circles are also linked to Irish ritual and spirituality. The shape represents a deeper meaning. 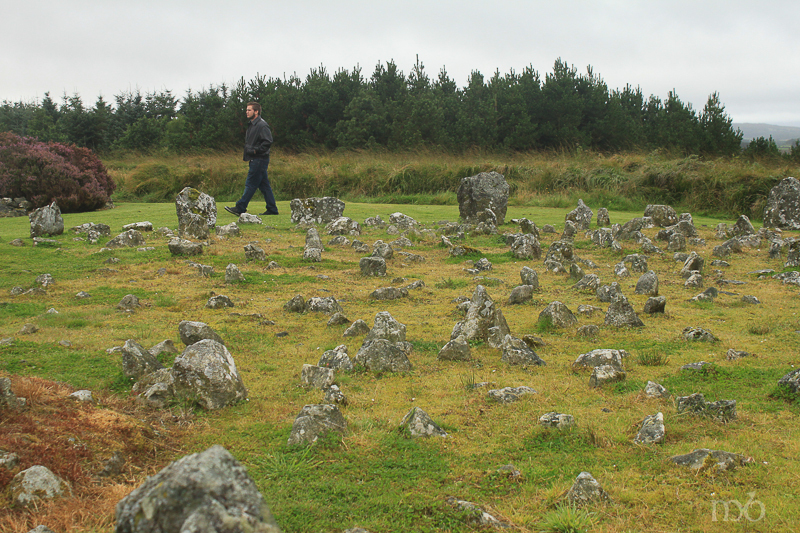 Stone circles, carved spirals on implements and burial stones, circular mounds covering passage tombs indicate this. There was also a later belief that circular buildings had no corners for evil entities to hide. Thus one can’t dismiss the spiritual importance of Grianán of Aileach, even though the cashel marked it as a secular site. 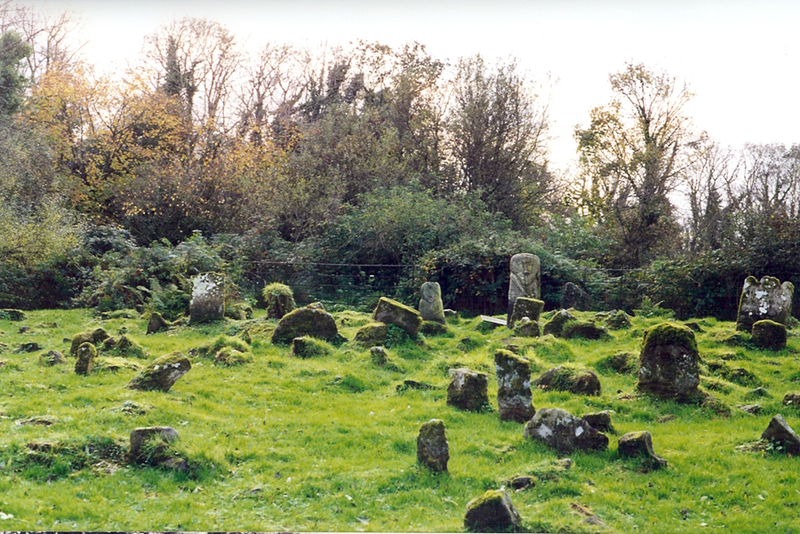 The traditional beliefs embedded in the Irish life permeated all they did. This circular fort sitting atop three concentric circles on a circular hill was built with circles in mind. And the site has a powerful energy about it. Originally the cashel had been the stronghold of the 4th century chieftain, Niall of the 9 Hostages. 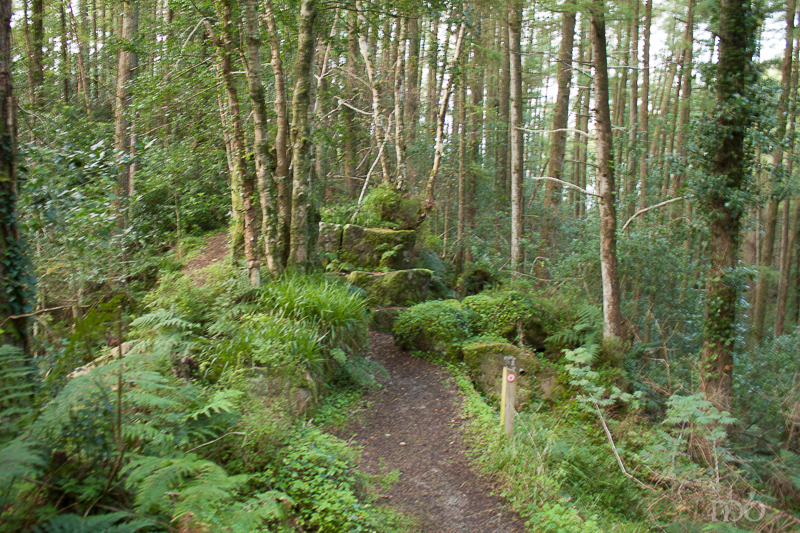 Later it became the stronghold of the O’Neill kings and the O’Donnells. The cashel was mostly destroyed in 1101 by the king of Munster, Murtagh O’Brien and his army in retaliation for the O’Neill’s destruction of his palace in Clare (Kincora). 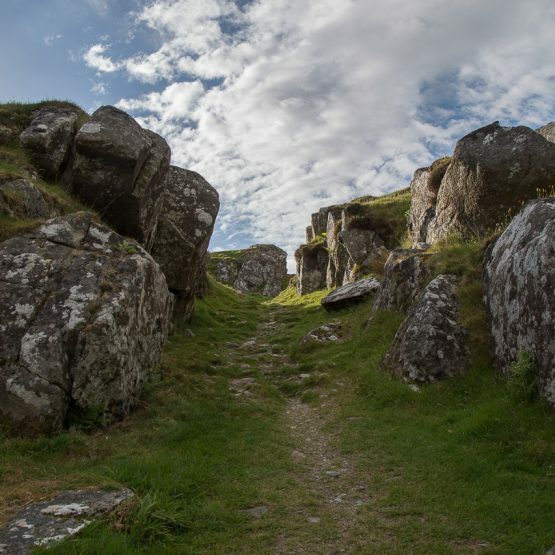 After they sacked Grianán of Aileach, Murtagh O’Brien told his army of a thousand men to each take a stone from the cashel with them so that the fort could not be rebuilt. The cashel was later restored again in 1837 by a Dr. Bernard from Belfast. And in 2007 the Irish Office of Public Works restored it to the excellent condition it is in today. Some say it is over restored. But over-restoration has not blocked the ancient energy that still apparently seeps from the ground and surroundings. Irish Musician, Tommy Makem in his book Tommy Makem’s Secret Ireland wrote about his experience in trying to tape a television interview with Derry songwriter, Roy Arbuckle inside the cashel . Arbuckle laughed and told Makem that they’d never be able to record inside the walls. Makem couldn’t see any reason why it shouldn’t work. 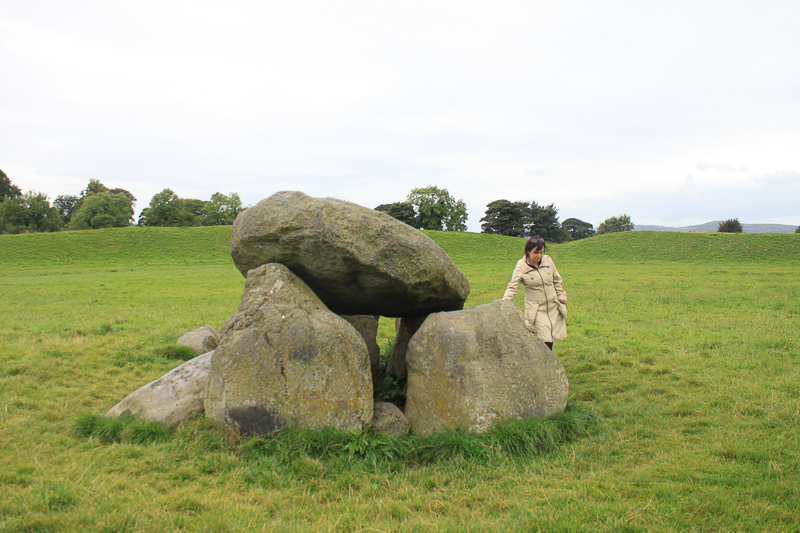 It is true that Grianán of Aileach has an energy about it. One feels it on the walk up the hill to reach the cashel. It’s mad windy on that hilltop but as soon as you enter the linteled doorway into the ring, all the sounds of wind cease. Everything is suddenly still, and there is a strange silence. As soon as I crossed that threshold my imagination moved immediately to those who were in this space before… the sounds, the voices, the cheering, the shouting almost as if an old movie was playing in my head. 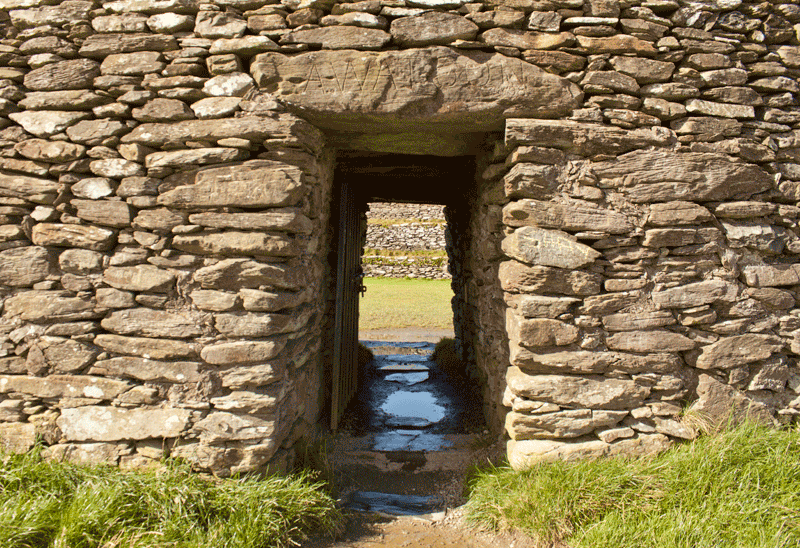 The entrance into the cashel is a threshold the opens into a place of different energy. Over-restored or not, that energy is still present and the views of the surrounding landscape are some of the best I’ve seen in Ireland. 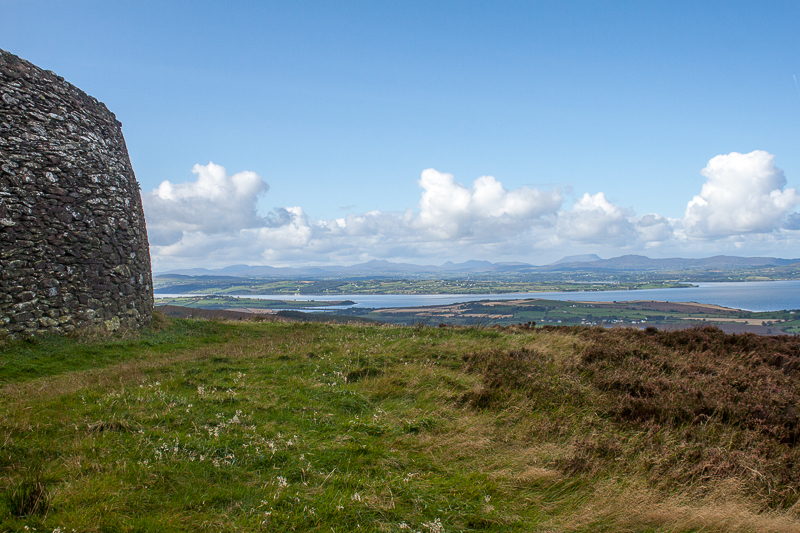 Standing on the top level of the cashel ridge I surveyed the breadth of three counties – their pastures, mountains and Loughs Foyle and Swilly. 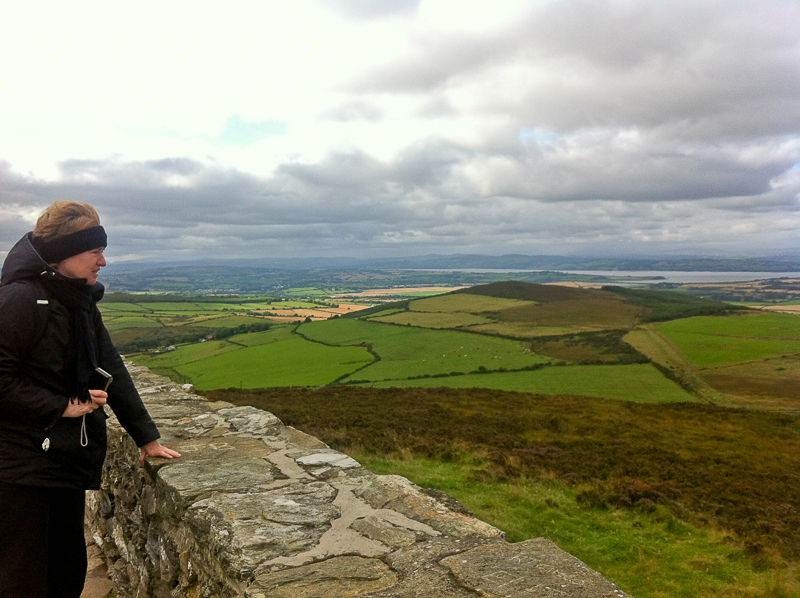 The oneness of Ireland then and now is knitted together in that view. One can see the approximate location of Rathmullen, a village on the west bank of Lough Swilly. It was from there that Hugh O’Neill and Rory O’Donnell left on a French boat bound for Spain one midnight in September of 1607. With 90+ relatives they sailed out of Lough Swilly changing the Irish social and political landscape forever. 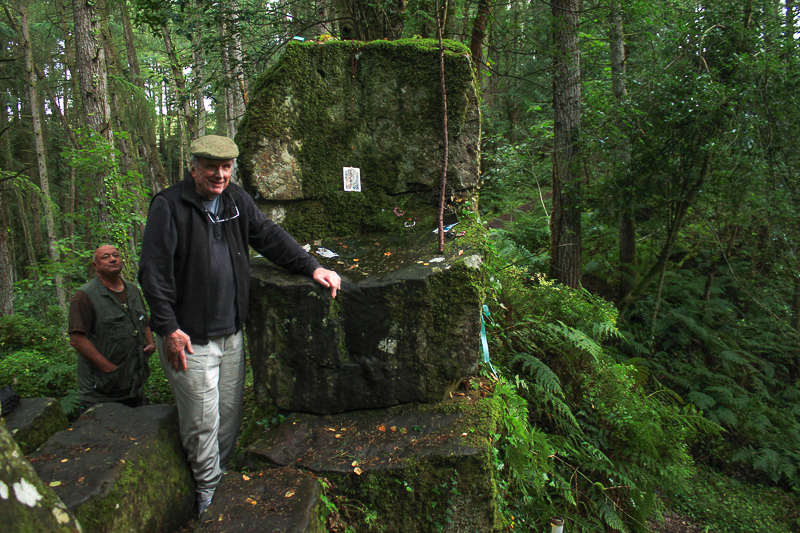 It marked an end to the old Gaelic order. An order of Chieftains and clans and common beliefs and the practice of rich traditions rooted in an ancient time. 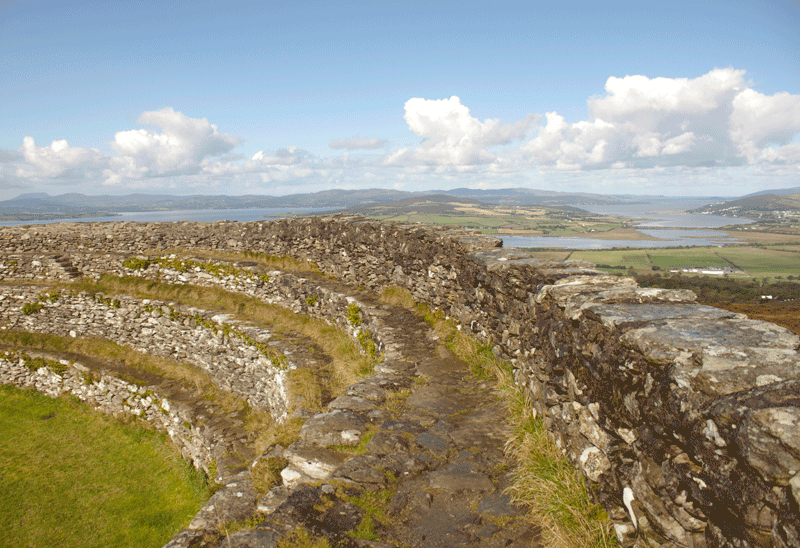 And behind the fleeing earls was Grianán of Aileach, a remnant of old Ireland. 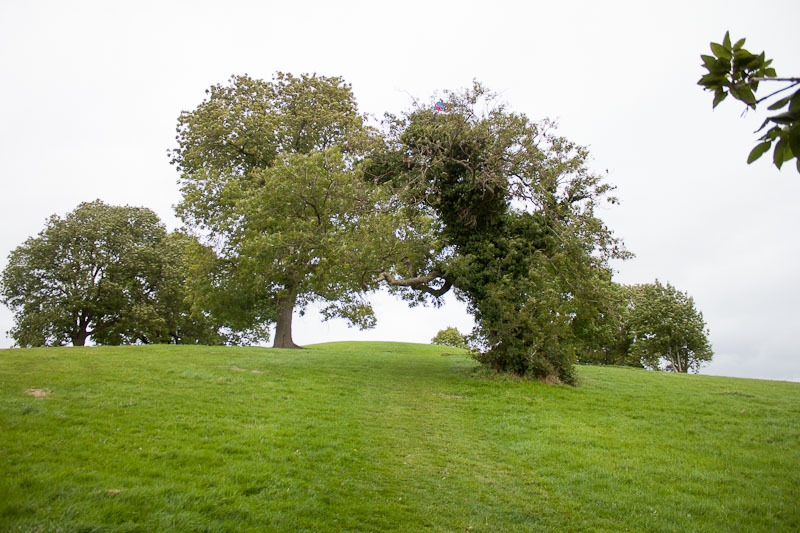 In its time it was a great royal center, second to the Hill of Tara. 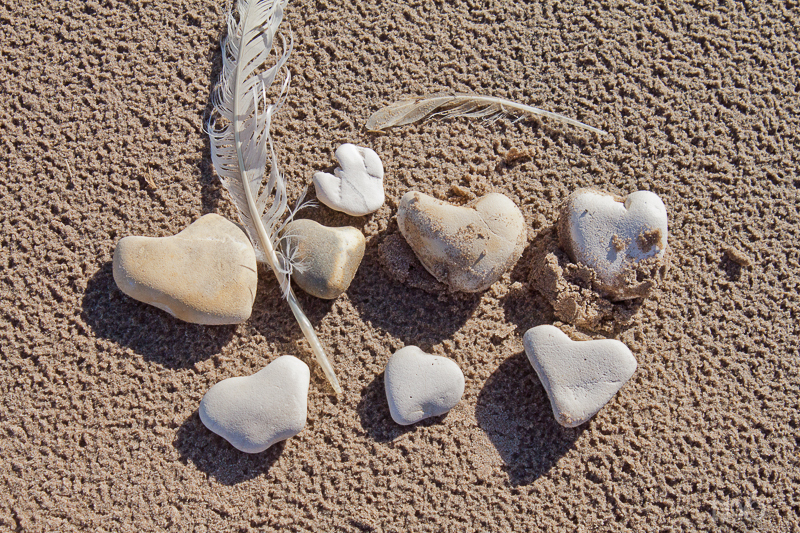 An ancient road links them to each other. There is a legend of a cave in the hill beneath the cashel where the horsemen of the Great Hugh O’Neill rest in a magic sleep in full armor, mounted on their horses. The sleeping spell will only be broken when the next destined leader of Ulster arrives to lead them to victory. 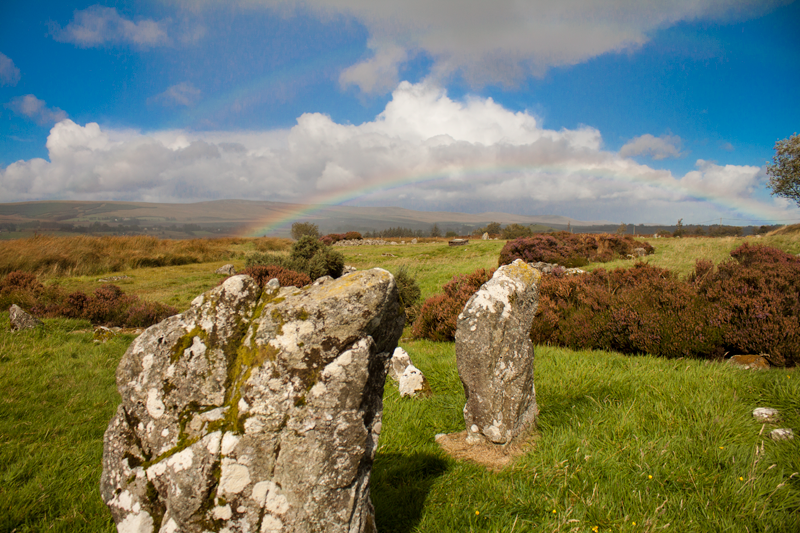 So it seems there’s still a little magic left at Grianán of Aileach.